I am glad that the treaty tribes in western Washington were finally able to reach agreement with the state on a package of conservative salmon fisheries for Puget Sound. It took more than a month of overtime negotiations to make it happen, but cooperative co-management showed us the way. Western Washington is unique because 20 treaty Indian tribes and the state Department of Fish and Wildlife jointly manage the salmon resource and share the harvestable number of fish returning each year. That job was a lot easier when there were more fish to go around. But salmon populations have been declining steadily for decades because their habitat is disappearing faster than it can be restored. Salmon returns the past couple of years – especially coho – have taken a sharp turn for the worse. Some say just stop fishing and that will fix the problem. It won’t. From birth to death, habitat is the single most important aspect of a salmon’s life. As the habitat goes, so go the salmon and tribal culture and their treaty fishing rights. For millions of years, salmon were abundant in western Washington. Their sheer numbers, naturally high productivity and good habitat provided resiliency from the effects of disease, drought and a host of other environmental factors. We must rebuild that resilience. As salmon populations grow smaller, management becomes increasingly difficult, and the co-managers struggle to divide a steadily shrinking pie. We must make the pie bigger. The non-stop loss of salmon habitat in western Washington must be halted so that our habitat restoration efforts can successfully increase natural salmon production. In the meantime, we need to rely on hatcheries to provide for harvest and help offset the continuing loss of habitat. We also must build resiliency in the co-manager relationship created by the 1974 ruling in U.S. v. Washington that upheld tribal treaty-reserved rights and established the tribes as salmon co-managers. We remember the bad old days of the late ’70s and early ’80s when the tribal and state co-manager relationship was new and mistrust ran deep. We spent a lot of time, money and energy fighting one another in federal court hearings rather than focusing together on the resource. Things didn’t begin to change until former state Fish and Wildlife director Bill Wilkerson said enough was enough and sat down with the late NWIFC Chairman Billy Frank Jr. The result was the birth of cooperative co-management in 1984 which led to the annual development of agreed fishing plans that allowed the tribes and state to focus on managing the fish instead of fighting each other in court. This year, for the first time in more than three decades, the tribal and state co-managers failed to reach agreement on a joint package of Puget Sound salmon fisheries within the North of Falcon process timeframe. Instead we developed separate fishing plans for consideration by NOAA Fisheries under their ESA authority. But in the true spirit of co-management, we kept the door open to further negotiations, and it worked. We weathered the storm together and we are stronger for it. We know our relationship will be tested again in the years to come. But this year has shown us that we can survive those challenges as long as we keep cooperation at the heart of co-management. As we begin our third decade of the annual state and tribal salmon co-managers’ salmon season setting process called North of Falcon, it’s a good time to look at how far we’ve come and talk about our hopes for the future. There were some tough days in the decade following the 1974 ruling by Judge George Boldt in U.S. v Washington, which upheld tribal treaty-reserved fishing rights and established the tribes as co-managers of the salmon resource with the state of Washington. At first the state refused to implement the ruling under the mistaken idea that the Boldt decision would be overturned on appeal. There was chaos on the water. It got so bad that Judge Boldt suspended the state’s authority to manage salmon for several months and turned the state’s management authority over to the federal government. It took time, but gradually the state and tribes learned to trust one another and work together. We realized the value of working cooperatively together to manage the resource rather than spending our time and money on attorneys fighting each other in court. Out of that need for trust and cooperation, the North of Falcon process was born. It is named after the cape on the Oregon Coast that marks the southern boundary of the management area for fisheries harvesting Washington salmon and it extends north to the Canadian border. While North of Falcon negotiations begin in earnest this month, the state and tribal co-managers have been hard at work for weeks developing pre-season forecasts, conservation goals and estimates of impacts to specific salmon stock at various levels of fishing effort. This year the process has a new participant in Jim Unsworth, who recently replaced Phil Anderson as director of the Washington Department of Fish and Wildlife. We look forward to working with him to develop management plans and fishing seasons that will address our salmon recovery goals while providing some fishing opportunity. We will also work with Mr. Unsworth to protect and restore salmon habitat and to properly manage our fish hatcheries that we need to support fishing opportunity. We have a lot of work to do together in the years ahead to recover salmon and address the many conservation challenges we face. But we know that our communities – and our shared natural resources – are stronger when the co-managers work together. After all, we have much in common. With the current condition of the degraded habitat in our rivers and marine waters, we all need hatcheries to provide salmon for harvest. We also need good habitat for our fish. Whether hatchery or wild, salmon need plenty of clean, cold water, access to and from the ocean, and good in-stream and nearshore marine habitat where they can feed, rest and grow. It is the amount and quality of salmon habitat – more than any other factor – that determines the health of the salmon resource. We must carefully manage the habitat, the hatcheries and the fisheries if we are to return salmon to abundant and sustainable levels. Successful salmon recovery depends on it. Lorraine Loomis, Chair of the Northwest Indian Fisheries Commission. I am honored and humbled to follow in the footsteps of Billy Frank Jr. as chair of the Northwest Indian Fisheries Commission. Of course no one can ever truly replace our longtime chairman and friend Billy Frank Jr. It will take all of us to do that. Billy wrote this column for many years. The tribes decided to keep the name to honor him and remind everyone what this column is about: Frank, honest talk from the treaty Indian tribes in western Washington who are co-managers of the natural resources. Like many people, I drew much strength from Billy over the years. But the biggest source of strength for me has always been my family, especially my parents. My dad, Tandy Wilbur, was the first general manager of the Swinomish Tribe. He and my mother, Laura, worked tirelessly to secure the funding that founded the Swinomish tribal government. When he passed away in 1975 my mother continued their work. 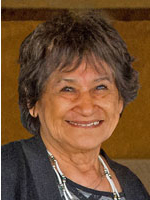 She went on to serve for 50 years in the tribal senate and was instrumental in tribal advances in housing and health care before her passing in 1997. I started out in the fish processing business in 1970. It was hard work and long hours. I switched to fisheries management following the Boldt decision in 1974. I thought that maybe fisheries management might be a little bit easier than working 14-15 hours a day, seven days a week. My dad told me that it would take about 10 years before the Boldt decision would operate as it should. There was a lot of fighting with non-Indian fishermen in the early days after the Boldt decision. You never knew what to expect when you went out on the water. It was 1982 before true co-management became a reality through development of the first joint Puget Sound Salmon Management Plan by the tribes and state. As my tribe’s fisheries manager for 40 years, I’ve seen incredible advances in salmon co-management, both regionally and internationally. I am especially proud of tribal involvement in developing and implementing the U.S./Canada Pacific Salmon Treaty that governs the sharing of salmon between the two countries. I continue to serve on the Fraser River Panel that manages sockeye and pink salmon through the treaty. I also continue to coordinate tribal participation in the North of Falcon fishery planning process with the state of Washington. I have served as an NWIFC commissioner for the past 30 years, most of them as vice-chair. I love fisheries management. When we have a fishery opening – and salmon fishing is not open a lot these days – you see the happy faces of the tribal fishermen. You know you have done your job. I live for that. It’s my life. None of us tribal natural resources managers are working for today. We are all working for tomorrow. We are working to make certain there will be salmon for the next seven generations. We face many challenges in the years to come. Salmon populations continue to decline because we are losing habitat faster than it can be restored. As the resource continues to decline, salmon management becomes increasingly difficult because there is less room for error. That puts our tribal treaty rights at great risk. We need hatcheries and habitat to bring back the salmon. We need hatcheries to provide salmon for harvest, support recovery efforts and fulfill the federal government’s treaty obligations. We need good habitat because both hatchery and wild salmon depend on it for their survival. We also need to work together, because that is always best. We’ve known for a long time that cooperation is the key to salmon recovery, and that we must manage for tomorrow every day. Shawn Yanity, chairman of the Stillaguamish Tribe, has been elected vice chair of the Northwest Indian Fisheries Commission. The commission, based in Olympia, represents 20 tribes in the state, with a member from each tribe serving in the group. A chair, vice chair and treasurer are elected from among the commissioners. Former Chair Billy Frank Jr. died in May at age 83. He is remembered as a lifelong fisherman, a passionate advocate for the fishing and hunting rights of Northwest tribes, and a longtime leader of the commission. Lorraine Loomis, fisheries manager for the Swinomish Tribe and previous vice chair of the commission, was selected as the new chair. Yanity, 49, became chairman of the Stillaguamish Tribe in 2004 and has been on the fisheries commission since 2000. “Together we focus on all the treaty issues, everything from clean water to salmon, shellfish, groundfish and wildlife,” Yanity said. The commission provides resources for tribes facing specific concerns, such as microbiologists to handle disease outbreaks at fish hatcheries. The group also acts as a sort of database on Washington fish and their habitats, from mountain streams to the salty coastline. Commission goals include upping wild salmon populations, pushing for legislation to prevent pollution in Puget Sound and cleaning up rivers and streams around Western Washington, Loomis wrote in a message to the commission earlier this year. Frank left his wisdom and teachings for the commission, Yanity said. The group aims to follow in his footsteps, pushing for cleaner waters, protecting native fish populations and advocating for the tribes’ treaty rights to fish and hunt throughout the state. OLYMPIA – Lorraine Loomis, a Swinomish tribal member, has been elected chair of the Northwest Indian Fisheries Commission. 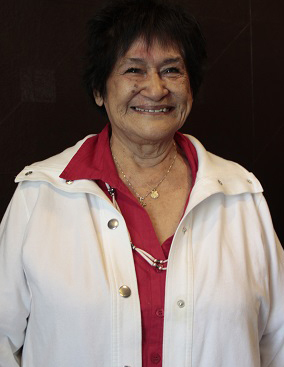 She replaces the late Billy Frank Jr., who served as NWIFC chairman for more than 30 years. Frank died on May 5, 2014 at the age of 83. Loomis, who was serving as vice-chair of the commission, will fill the remainder of Frank’s term as chair through May, 2016. 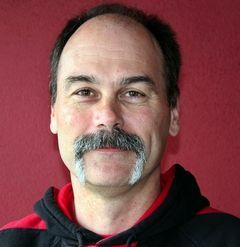 Shawn Yanity, Stillaguamish tribal chair, was elected to replace Loomis as vice chair. Ed Johnstone, Quinault Indian Nation, will continue as NWIFC treasurer. Loomis, 72, has been Swinomish tribal fisheries manager since 1975. She has extensive experience in fisheries management throughout the region. She currently serves on the Fraser River Panel of the Pacific Salmon Commission that manages sockeye and pink salmon under the U.S./Canada Pacific Salmon Treaty. Loomis also coordinates tribal participation in the annual North of Falcon salmon season development process with the State of Washington. The NWIFC is a support service organization for the 20 treaty Indian tribes in western Washington that are co-managers of the region’s natural resources with the State of Washington. The commission provides services to tribes in areas such as fisheries management, habitat protection and fish health. The NWIFC also provides a forum for tribes to address shared natural resource management concerns and enables the tribes to speak with a unified voice. The NWIFC is headquartered in Olympia, with satellite offices in Forks, Burlington and Kingston and employs a staff of 70. Honoring the Legacy of Billy Frank Jr. Being Frank is the monthly opinion column that was written for many years by the late Billy Frank Jr., NWIFC Chairman. To honor him, the treaty Indian tribes in western Washington will continue to share their perspectives on natural resources management through this column. This month’s writer is Lorraine Loomis, vice-chair of the NWIFC and fisheries manager for the Swinomish Tribe. OLYMPIA – So much has been written and said about the passing of Billy Frank Jr., our great leader and good friend. Many people are asking how to honor Billy’s memory. Who will take his place? We must recover wild salmon to levels that can once again support harvest. That is the only true measure of salmon recovery. To do that, we must do more to protect and then to restore salmon habitat. Right now we are losing habitat faster than it can be fixed. That must change or we will continue to lose the battle for salmon recovery. We must maintain strong salmon hatchery programs. Most hatcheries were built to mitigate for lost natural wild salmon production caused by damaged and destroyed habitat. Tribal, state and federal hatcheries are operated safely, responsibly and using the best science to minimize impacts on wild salmon. Some hatcheries produce salmon for harvest. Others aid recovery of weak wild stocks. Every hatchery is essential to meeting the tribal treaty right by contributing salmon that are available for harvest. Without hatcheries there would be no fishing at all in most areas of western Washington. We must have hatcheries as long as wild salmon habitat continues to be degraded and disappear. We must achieve a more protective fish consumption rate and maintain the current cancer risk rate to improve water quality and protect the health of everyone who lives in Washington. The two rates are key factors that state government uses to determine how much pollution can be dumped in our waters. The state admits that the current fish consumption rate of 6.5 grams per day (an amount that would fit on a soda cracker) does not protect most of us who live here. It is among the lowest rates in the country, despite the fact that we have one of the largest populations of fish and shellfish consumers in the United States. Currently the cancer risk rate from toxins in seafood that the state uses to set water quality standards is one in a million, but Gov. Jay Inslee is considering a move to reduce that rate to one in 100,000, a tenfold decrease in protection. We believe Washington’s fish consumption rate should be 175 grams per day – the same as Oregon – and that the cancer risk rate should remain at one in a million. We must really, truly clean up Puget Sound. Every few years state government creates a new agency or cooperative effort to make that cleanup a reality. Year after year, decade after decade, we have all been working toward that goal, but we are not making sufficient progress. The main reason is lack of political will to develop and enforce regulations that could make cleanup a reality. Until that changes, the cleanup of Puget Sound will not happen. We must stop plans to expand the transport and export of coal and oil through our state’s land and waters. Increased oil train and tanker ship traffic and more export terminals offer nothing but problems. The likelihood of oil train explosions and derailments, along with the potential for devastating spills from tanker ships, threaten tribal treaty rights, the environment, our natural resources, our health and even our very lives. The few, mostly short-term jobs that they might provide are just not worth the cost. We must continue to work together on the problems we all share. We have shown that great things can be accomplished through cooperation, such as the Timber/Fish/Wildlife Agreement and the U.S./Canada Pacific Salmon Treaty. If we work together we can achieve both a healthy environment and a healthy economy. If we continue the conflict we will achieve neither outcome. A healthy environment is necessary to support a healthy economy in this region and the people who live here demand it. Billy worked his entire life to make western Washington a better place for all of us to live. Tribal treaty rights that protect natural resources help make that possible, and benefit everyone who lives here, not just Indian tribes. As for the question of who will pick up where Billy left off, the answer is all of us. No single person will ever be able to replace him. That’s a job for everyone. There is only one direction we can go: Forward – together – on the path Billy showed us with the teachings he shared. Both hatchery and wild fish are needed for steelhead and salmon recovery in western Washington, says Billy Frank Jr., chairman of the Northwest Indian Fisheries Commission. “There’s no way we can do it without both,” said Frank, responding to a lawsuit against the state of Washington by a group claiming that state hatchery steelhead releases are undermining recovery of ESA-listed wild steelhead, chinook and bull trout in Puget Sound. The Wild Fish Conservancy wants the program halted and is seeking an injunction to stop the Washington Department of Fish and Wildlife from releasing nearly 1 million hatchery steelhead this spring. WDFW has said it will not release the fish unless or until it can reach an agreement with the group. Science guides the operation of hatcheries in western Washington, Frank said. Hatcheries are carefully managed to protect the genetic health of wild fish. Without hatcheries and the fish they produce, there would be no fishing at all. Indian and non-Indian fishermen, their families, businesses and many others depend on the salmon and steelhead that hatcheries provide, Frank said. Because wild fish populations have continued to decline along with their habitat, hatcheries are critical to providing fish for harvest. Hatchery fish are also essential to fulfilling tribal treaty-reserved fishing rights, which depend on fish being available for harvest. Properly managed hatcheries can be a valuable tool for wild fish restoration by supplementing natural spawning and increasing natural-origin fish abundance, Frank said. That is why lawsuits like the one filed by the Wild Fish Conservancy are so disappointing, Frank said. 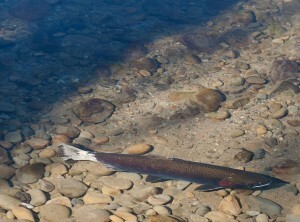 Once a hatchery salmon is released, it has the same habitat needs as wild fish. Those needs include clean, cold water; access to and from the sea; and good spawning habitat. For more information: Tony Meyer, NWIFC, (360-438-1180) tmeyer@nwifc.org; or Emmett O’Connell (360- 438-1180) eoconnell@nwifc.org. OLYMPIA – When it comes to your chances of getting cancer from the foods you eat, what odds would you like: one in a million, or one in 100,000? Of course all of us would prefer the least amount of risk. That’s why it’s hard to believe that Gov. Jay Inslee is even considering changing water quality rules that would increase that risk. The justification? Businesses such as Boeing say that protecting your health increases their cost of doing business. There are two important numbers that go into determining how much pollution the state allows to be put in our waters. The numbers are 10-6 and 6.5. The first number is your cancer risk rate from eating fish and shellfish containing toxics from pollution in our waters. Right now that rate of 10-6 provides you a one in a million chance of getting cancer. But Gov. Inslee is considering changing the risk rate to 10-5, increasing your exposure to known carcinogens to one in 100,000. That’s a tenfold decrease in protection, and that’s not right. The second number is the amount of seafood that the state of Washington says you eat every day. The lower the number, the less protective water quality standards need to be to protect us from poisons in our water. The problem is that the state’s current rate of 6.5 grams per day (equal to about one 8-ounce portion per month) is one of the lowest fish consumption rates in the nation. It’s lower even than states like Iowa, despite the fact that Washington has abundant seafood and one of the largest populations of fish and shellfish consumers in the United States. The state admits that the current fish consumption rate doesn’t protect most of its citizens, yet has used that very same rate to set water quality standards for more than two decades. After years of prodding by the tribes, environmental groups and others, the state has finally agreed to develop a more realistic rate and is considering a range from 125 to 225 grams per day. While that’s encouraging, if the state adjusts the companion number, the cancer risk rate, any increase in the fish consumption rate would be made almost meaningless in terms of improved water quality standards. The treaty tribes have been clear from the start about what we would like to see. We think the cancer risk rate should stay right where it is, and the fish consumption rate should be at least 175 grams per day. That’s the same rate that Oregon uses. We think everyone deserves at least that much protection. That’s especially true for tribes, sport fishermen and anyone else who eats a lot of fish and shellfish. We should know Gov. Inslee’s decision on the fish consumption and cancer risk rates in a few weeks. We hope he will decide in favor of protecting our health and water quality. The choice really boils down to whether we want a pollution-based economy or one that puts people and their health ahead of profits. The Upper Skagit Indian Tribe is tagging juvenile steelhead to estimate freshwater productivity and learn more about smolt-to-adult survival in the Skagit River. Steelhead have a complex life history, making it hard for salmon managers to forecast returns. Juvenile steelhead can leave freshwater habitat between their first and fourth year of life, and return from the salt water after one to five years. In addition, steelhead are repeat spawners, unlike other species of salmon, so they can return to salt water before coming back to fresh water to spawn again. Compared to other river systems in Puget Sound, the Skagit River still has an abundance of wild steelhead. 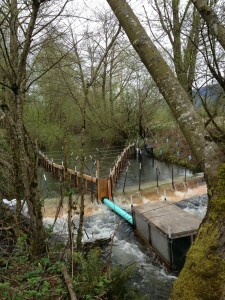 A fish weir guides juvenile steelhead into a trap in Hansen Creek. The steelhead are tagged and then released to help fisheries managers learn more about smolt-to-adult survival. The tribe has partnered with the state Department of Fish and Wildlife to collect steelhead smolts using screw traps in Hansen and Illabot creeks. The smolts are tagged with passive integrated transponder (PIT) tags that will provide data when the steelhead leave and return to the two tributaries. These PIT-tagged steelhead can also be monitored for encounters in other research or harvest sampling. This spring, the Upper Skagit Natural Resources Department plans to install one PIT tag antenna array in Hansen Creek that will record information when tagged fish swim over the antennas. If funding is secured, another antenna array will be installed in Illabot Creek next year. Previous data has shown that steelhead out-migrate from the upper Skagit watershed at an older age compared to fish in the lower watershed. Illabot Creek is near Rockport in the upper watershed, and Hansen Creek is in the lower watershed near the tribe’s Sedro-Woolley reservation. Ultimately, the tribe wants to incorporate this research into long-term monitoring in the Skagit basin, but has not identified a long-term funding source.